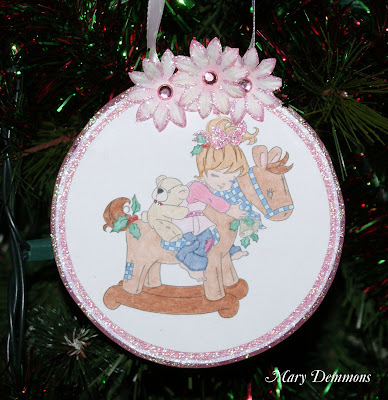 I made this Christmas ornament using this adorable image from Belles N Whistles. I colored the image using crayola and prisma colored pencils. I cut the image out into a circle and backed in pink cardstock then white cardstock and then raspberry cardstock. I added 3 pink paper flowers to the top and added a pink rhinestone into the center of each one. I added crystal stickles to the edges of the flowers and to each layer around the image. I made this ornament for the challenge at Just Cute Bears and Friends (anything but a card). I am also entering this ornament into the challenge at Top Tip Tuesday (get embellishing). This is adorable, such a sweet image. I'm sure you'll use it year after year now. Thanks for joining us at Just Cute Bears & Friends. Gorgeous - love all the sparkle!